The Federalist Alexander Hamilton, James Madison John Jay Introduction Notes by Robert A. Ferguson (List Price 7.95 - 510 Pages) A classic of American political thought,The Federalist is a series of eighty-five essays by three authors - Alexander Hamilton, James Madison, and John Jay.The purpose of which was to gain support for the proposed new Constitution of the United States, a document that many considered too radical. Most of the "papers" were published in periodicals as the vote on approving it drew near. Without the support of these powerfully persuasive essays, the Constitution most likely would not have been ratified and America might not have survived as a nation. Beginning with an assault upon the country's first constitution, the Articles of Confederation, the authors of The Federalist present a masterly defense of the new system. Hamilton, Madison, and Jay, three of our most influential founders comment brilliantly on issue after issue, whether it be the proper size and scope of government, taxation, or impeachment. Today lawmakers and politicians frequently invoke these commentaries, more than 200 years after they first appeared. Written in haste and during a time of great crisis in the new American government, the articles were not expected to achieve immortality. Today, however, many historians consider The Federalist as the third most important political document in American history, just behind the Declaration of Independence and the Constitution itself. They have become the benchmark of American political philosophy, and the best explanation of what the Founding Fathers were trying to achieve. This 2006 Barnes Nobel paperback edition is Brand New, stored in and delivered from a smoke free environment. Item shipped USPS Media Mail next business day after receipt of payment. The Federalist, by Alexander Hamilton, James Madison, and John Jay, is part of the Barnes Noble Classics series, which offers quality editions at affordable prices to the student and the general reader, including new scholarship, thoughtful design, and pages of carefully crafted extras. Here are some of the remarkable features of Barnes Noble Classics: All editions are beautifully designed and are printed to superior specifications; some include illustrations of historical interest. Barnes Noble Classics pulls together a constellation of influences--biographical, historical, and literary--to enrich each reader's understanding of these enduring works. 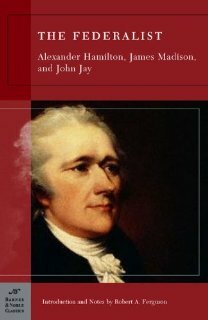 A classic of American political thought, The Federalist is a series of eighty-five essays by three authors-- Alexander Hamilton, James Madison, and John Jay--the purpose of which was to gain support for the proposed new Constitution of the United States, a document that many considered too radical. Most of the "papers" were published in periodicals as the vote on approving it drew near. Without the support of these powerfully persuasive essays, the Constitution most likely would not have been ratified and America might not have survived as a nation. Beginning with an assault upon the country's first constitution, the Articles of Confederation, the authors of The Federalist present a masterly defense of the new system. Hamilton, Madison, and Jay--three of our most influential founders--comment brilliantly on issue after issue, whether it be the proper size and scope of government, taxation, or impeachment. Today lawmakers and politicians frequently invoke these commentaries, more than 200 years after they first appeared. Written in haste and during a time of great crisis in the new American government, the articles were not expected to achieve immortality. Today, however, many historians consider The Federalist as the third most important political document in American history, just behind the Declaration of Independence and the Constitution itself. They have become the benchmark of American political philosophy, and the best explanation of what the Founding Fathers were trying to achieve. Robert A. Ferguson is George Edward Woodberry Professor in Law, Literature, and Criticism at Columbia University; he teaches in both the Law School and the English Department. His books include Law and Letters in American Culture, The American Enlightenment, 1750-1820, and Reading the Early Republic. Returns always accepted for purchase price refund. Please contact Seller before returning item to receive Return Authorization Code. Return shipping costs are responsibility of Buyer. If you have a problem please contact seller before placing negative feedback. As Always, thank you for your business.